Does your college offer digital archives online? If so, you might find some good memories within their files. My alma mater, Illinois Wesleyan Univerity, is a smaller school of 2,000 students. When I attended in the late 90s we didn’t have social media. To my knowledge, there was only one digital camera on campus–to be leased through the art building. Our memories weren’t recorded online. Photos were taken on film and stored in shoeboxes. If you’re lucky, some photos were published in a school newspaper or yearbook. Maybe you have your school yearbooks. Certainly you don’t have a stack of school newspapers. Find if your school has their newspapers in an archive. Hint: don’t look for the archive on the school’s newspaper site. Chances are, newspaper website archives only go back a couple years. Instead head to your school’s library. Better yet, maybe their archive department. Many Illinois schools participate in the CARLI (Consortium of Academic and Research Libraries in Illinois. Search for your school. Searching through the newspaper archives is fun to see what you can uncover. It’s even more fun to share with others. Help bring your school’s archives to life by sharing screenshots with your old classmates. Your school’s archives department will be happy that their services are being used. 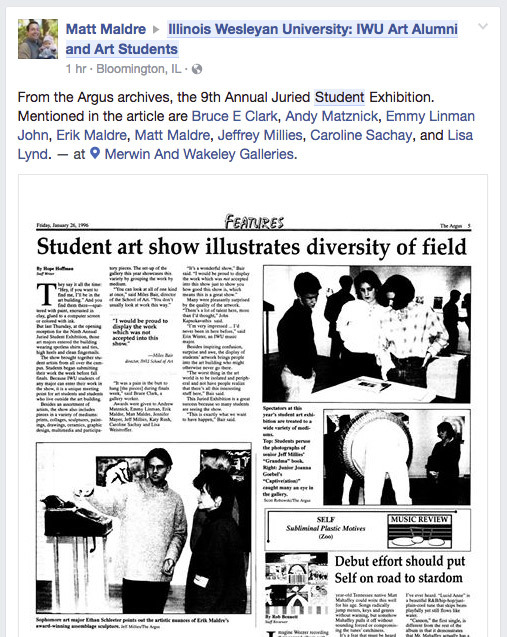 Now that I can search through IWU’s newspaper archives, I’ll find articles about our school’s art students, and post screenshots of the articles on our Facebook Group for art alumni. When you share a post like this, make sure to tag the people mentioned in the article. At some point I’m considering taking my film shoebox off the shelf and scanning all the prints. School’s archives tend to be limited to the school publications. Let’s hope schools would be happy to receive digital personal archives of photos taken during the analog era.